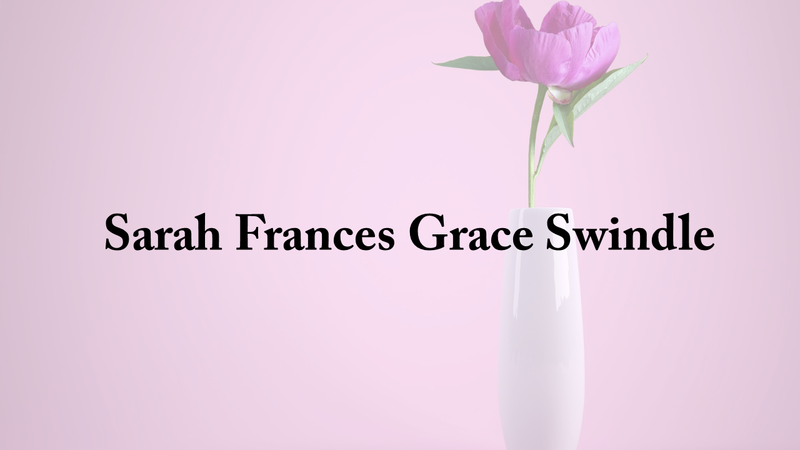 Sarah Frances Grace Swindle, 71, of Russellville, entered into rest on Feb. 7, 2019 at her home. Sarah was born on March 9, 1947, in Double Springs, Alabama. She enjoyed flowers, gardening in her spare time, and loved her grandchildren. Visitation will be held on Monday, Feb. 11, 2019 from 12 p.m. until 2 p.m. at Nichols Funeral Home in Double Springs, Alabama, where services will follow at 2 p.m. Bishop Michael Mann will officiate. Burial will follow in Fairview Missionary Baptist Church Cemetery in Double Springs, Alabama. Sarah is survived by her sons, Michael Dale Reed Jr. and his wife Amy, Wilford Harvey Reed (Bubby) and his wife Sarah; daughter Ramona Ann Miller (Penny) and her husband Jeff; and brother, Malcolm Grace. She was known as "Grandma" to 7 grandchildren, Chris Miller, Stanley Miller, Patrick Miller, Justin Reed, Brandon Reed, Kayleigh Reed, Rex Reed; several great grandchildren; and her aide and special friend Linda. She was preceded in death by her parents, Wilford Harvey Grace and Lucy Able Grace; brothers, Spurgeon, Milford, Kenneth, Lloyd, Herman, and Cary; sisters, Lorene, Earcle Mae, Christine, Mildred, Earlene, Anna Lou, and Ethel.